Travis Ward turned a hobby into a passion, refurbishing computers that are then given to students who need them. Money was an object when Travis Ward realized he wanted more than just a job in materials handling. The 2003 Landstown High School graduate researched colleges online and liked the fit he found at Tidewater Community College. He will graduate on Dec. 18 with an Associate of Science in Business Administration. The Virginia Beach native is also just a few credits shy of a Career Studies Certificate in Network Administration, which he plans to achieve this spring. Ward, 32, would like to transfer to Old Dominion University next fall to work toward a bachelor’s in network engineering. “I hadn’t been in school for a while, and TCC was a really good place to get my feet wet again,” he said. What Ward didn’t count on was turning a hobby into a part-time job. He had long been the tech support specialist in his family, helping his parents and two siblings by building them computers via trial and error. 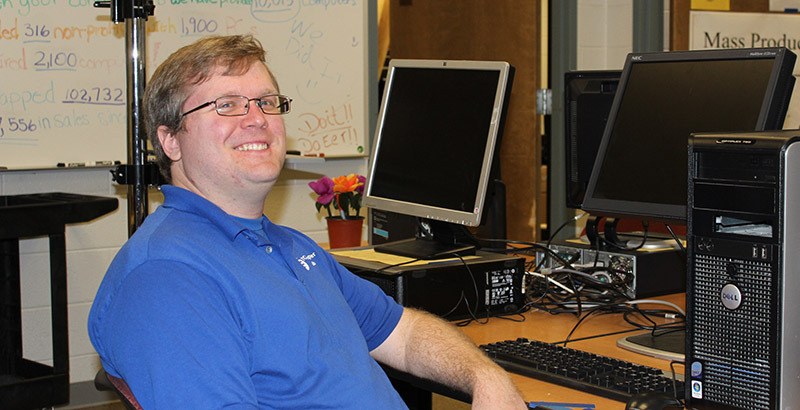 A year into his time at TCC, a professor mentioned the college’s Computers for Student Success Club, which refurbishes used computers and provides them to deserving students and nonprofits within the community. What started as a volunteer position under the supervision of Professor Gary Noah evolved into a part-time job that Ward enjoys coming to every day. Ward opens up shop every day at noon at the club’s home in the Lynnhaven Building of the Virginia Beach Campus. Enjoying the challenges that come with troubleshooting, he benefits from the autonomy Noah has entrusted in him, he said. Ward is proud to say he built the network from the ground up. He also enjoys seeing the reaction when students pick up what is often their first-ever computer. The club, which originated in 2009, recently gave out its 10,000th computer. Earlier this month, the club handed out holiday gift boxes containing laptops to single mothers taking full-time classes at TCC. Ward will graduate debt-free and better prepared, he said, for a career that will provide him with a financially stable future. He would enjoy a consulting position that would allow him to travel. Ward said the milestone of graduation night won’t be lost on him.